Abstract. Even if greenhouse gas emissions were stopped today, sea level would continue to rise for centuries, with the long-term sea-level commitment of a 2°C warmer world significantly exceeding 2m. 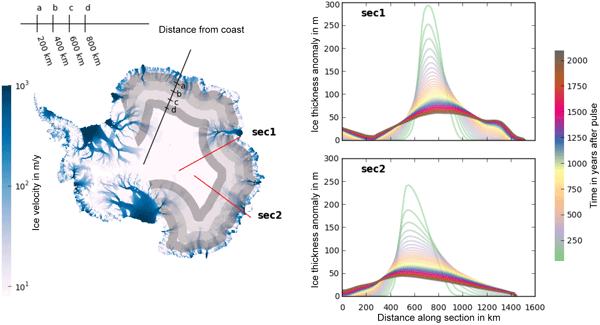 In view of the potential implications for coastal populations and ecosystems worldwide, we investigate, from an ice-dynamic perspective, the possibility of delaying sea-level rise by pumping ocean water onto the surface of the Antarctic ice sheet. We find that due to wave propagation ice is discharged much faster back into the ocean than would be expected from a pure advection with surface velocities. The delay time depends strongly on the distance from the coastline at which the additional mass is placed and less strongly on the rate of sea-level rise that is mitigated. A millennium-scale storage of at least 80% of the additional ice requires placing it at a distance of at least 700km from the coastline. The pumping energy required to elevate the potential energy of ocean water to mitigate the currently observed 3mmyr−1 will exceed 7% of the current global primary energy supply. At the same time, the approach offers a comprehensive protection for entire coastlines particularly including regions that cannot be protected by dikes. 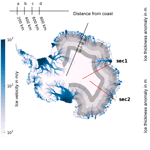 How to cite: Frieler, K., Mengel, M., and Levermann, A.: Delaying future sea-level rise by storing water in Antarctica, Earth Syst. Dynam., 7, 203-210, https://doi.org/10.5194/esd-7-203-2016, 2016.